From March until November training is held at our outdoor facility located south of West Park Secondary School on Louth Street. The track was originally built in 2001 and is carefully maintained and upgraded every year to a very high, Athletics Ontario sanctioned standard. It is a 400 m rubberized track with 8 lanes, a steeple chase pit, long and triple jump, high jump and javelin run ways and a shot put/hammer apron. We also have complete lighting for the entire facility, making it ideal for evening events. If your school would like to have preferred use of our facilities for weekly athlete training and/or Competitions, please download and complete the appropriate form. Submission and payment details are in the forms. If you have any questions, please contact: Sharon Stewart. The track is open to the public outside of practice hours. Those wishing to use the track must have a shoe tag. If you do not, you will be asked to purchase a tag or leave. 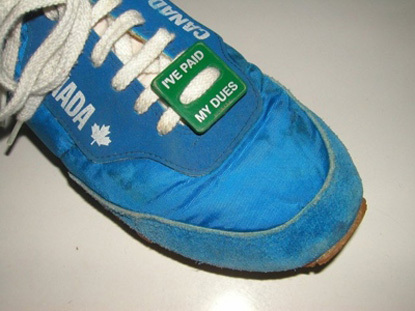 The shoe tag cost is $33.00 and is valid for 1 year. Please download the Shoe Tag application HERE!